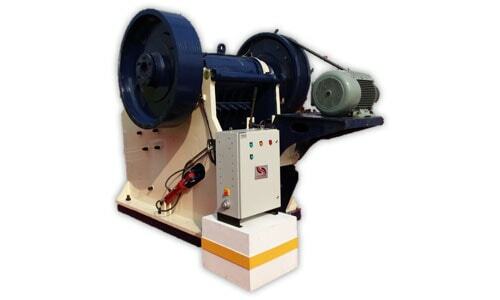 "KINGSON" Brand Single Toggle Grease Jaw Crusher is generally used where size distribution is not of paramount importance but productivity is to be maximized with lower power consumption as compared to Double Toggle Grease Lubricated Jaw Crusher and hence operating cost is lower. These do not require high operating skill and gap setting is simpler. Also, the maintenance requirement is much lower. ● OIncreased stroke for greater productivity, large eccentric shaft for strong stroke in the upper chamber. ● High angle toggle plate increases stroke in the lower chamber. ● Large precise counter balanced fly wheel provides continuous crushing in toughest applications. ● Stress relieved, robust, heavy duty crusher body and cast steel jaw plates for higher strength. ● In case of use as primary crusher, hydraulic cylinder is provided for easy adjustment of gap setting.